Prolab is delighted to offer you Kodak's new PROFESSIONAL ENDURA Media including Kodak Professional Duratrans and Duraclear. Which is part of Kodak award-winning range of silver-halide (AgX) color negative papers and display materials. Prolab also offers Fujiflex Crystal Archive Printing Material. Fuji Flex is a polyester-base silver halide material, optimised for professional colour printing of display and commercial prints. As with the Kodak Professional Endura Media Fujiflex is also designed for producing exceptional quality digital prints with LED exposing or other digital exposure systems. Photographic reproduction is well recognised in the imaging world as the highest quality achievable. Other methods of producing images refer to their products as being photo-like, photo realistic or printed on photo base media. 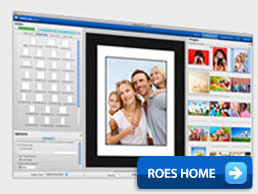 High quality digital photographic reproduction is resolution dependant. The manufacturers of digital photographic printing equipment specify their equipments printing resolution in continuous tone Pixels Per Inch (ppi). Inkjet printers specify resolution in Dots (of ink) Per Inch (dpi). It is generally considered that it takes 5-6 times the resolution in Dots per inch to match continuous tone resolution. It would require an Inkjet printer of at least 1500 Dots per inch of resolution to match the quality of a Photographic print printed at 300 Pixels per inch. 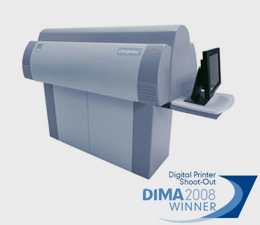 Prolab provide two Digital Photographic Printing services from your file. 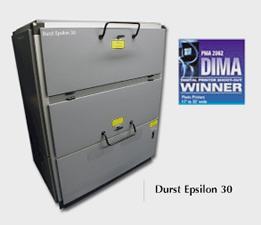 Durst Epsilon - LED exposure (RGB) with continuous exposure from roll to roll at 254ppi continuous tone. Maximum media roll width 76cm. ZBE Chromira - LED exposure (RGB) with continuous exposure from roll to roll at 300-425ppi continuous tone. Maximum media roll width 127cm. Prolab offers Custom Colour Profiles for all of our Professional Photographic Papers and Back-lit Materials, specifically designed for our LED printers to give you full control and the best possible outcome. Click on the image for icc soft proof profiles and installation instructions.